NASA's new 327-foot-tall Ares I-X rocket casts shadows on the massive Vehicle Assembly Building at NASA's Kennedy Space Center in Florida as it heads to Launch Pad 39B aboard a crawler-transporter on Oct. 20, 2009. Launch is set for Oct. 27. Thisstory was updated at 10:32 a.m. EDT. For thefirst time in nearly 30 years, a brand new NASA rocket has rolled out to aseaside launching pad in Florida to prepare for a launch test debut. The rocketis Ares I-X ? a suborbital prototype for the Ares I rocket NASA plans touse to launch its shuttle successor, the Orion spacecraft. Currently theworld?s tallest booster in service, the Ares I-X rolled out to the launch pad earlyTuesday and is slated to blast off Oct. 27 at 8 a.m. EDT (1200 GMT) on a shortdemonstration flight. ?The AresI-X is going to fly straight up and straight out,? said NASA commentator GeorgeDiller as the 327-foot (100-meter) tall rocket began moving toward Launch Pad39B at the Kennedy Space Center in Florida. ?During that time we?ll be testingthe stage separation to determine how well the first stage separation motorsperform, as well as the performance of the booster itself, namely theparachutes and other apparatus that will deploy.? The $445million rocket?s rollout comes on the eve of a final report from an independentcommittee appointed by the White House to review NASA?s plans for future humanspaceflight. During aseries of summer meetings, the committee found that NASA does not have thebudget to fund its vision of replacing the shuttle fleet by 2015 and returningastronauts to the moon by 2020. Led by former Lockheed Martin CEO NormanAugustine, the committee is due to release a report Thursday that detailsseveral options for President Barack Obama?s consideration, some of which donot include the Ares I rocket at all. Thecommittee?s upcoming report aside, the rollout of Ares I-X provided aspectacular sight, one which NASA broadcast live on NASA TV in its entirety.Reporters and photographers, along with NASA personnel, could be seen watchingthe giant rocket slowly make the 4.2-mile (6.7-km) launch pad trek. Not since theApril 1981 test flight of NASA?s space shuttle Columbia has NASA test launcheda new rocket designed to carry astronauts into space. 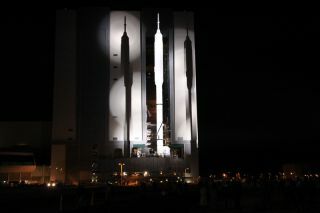 Like Columbia and itsexternal tank, the towering Ares I-X rocket is painted in all white and gleamedin the glare of blazing xenon spotlights as it emerged from the 52-storyVehicle Assembly Building. But unlike that first shuttle flight, Ares I-X willbe unmanned. ?Ares I-Xis rolling!? Diller said as NASA?s massive Apollo-era crawler-transportervehicle began hauling the new rocket to Pad 39B at 1:39 a.m. EDT (0539 GMT). The triptook about seven hours and started over an hour late due to slight delays inpreparation work, but the process appeared to go smoothly in the end. ?This hasbeen a little bit slow-going, but primarily because this is the first timewe?ve ever done this,? Diller said. Theskyscraping Ares I-X rocket stands 143 feet (44 meters) taller than NASA?sspace shuttles. It is the tallest rocket to emerge from the Vehicle AssemblyBuilding since the massive 363-foot (110-meter) Saturn V rocket used to launch Apolloastronauts to the moon in the 1960s and 1970s. The SaturnV holds the record for the tallest, most powerful rocket in history, but AresI-X is the tallest to fly today. For comparison, NASA?s space shuttles stand about184 feet (56 meters) tall in launch position. The spaceshuttle Atlantis is currently perched atop its own launch pad, Pad 39A for aplanned Nov. 16 liftoff. Not since 1975, when a Saturn IB rocket launched anApollo capsule to meet a Soyuz spacecraft from the Soviet Union, has anon-shuttle rocket sat atop a NASA launch pad. ?It?s neatto see where we?re going next [and] what the next step will be,? said Atlantiscommander Charlie Hobaugh, who arrived at the Kennedy Space Center Monday forprelaunch training. ?And that when we stop flying the shuttle at some future point,it?s not the end. It?s actually the beginning.? The AresI-X rocket weighs 1.8 million pounds (816,466 kg), and NASA engineers expectedits tip to sway up to 1 foot (0.3 meters) during the rollout. Altogether, theAres I-X rocket, its Mobile Launch Platform and the crawler-transporter itselfweigh about 16 million pounds (7.2 million kg). The AresI-X test rocket has threechances to launch next week, one a day each between Oct. 27 and Oct. 29.NASA initially planned to only have two days to try and fly Ares I-X, but onMonday the agency pushed the launch target for the space shuttle Atlantis toNov. 16 ? a four-day delay ? in order to allow the third opportunity. NASA?s AresI rocket is a two-stage launcher made up of a giant five-segmentsolid rocket booster first stage (similar to the four-segment versions usedon the space shuttle) and a liquid-fueled second stage. Completing the rocketis the Orion crew capsule and a launch abort system tower at the top. Therocket is tall and slender, and is thicker at the top than on the bottom. The AresI-X is not a full Ares I rocket. Its first stage is a four-segment solid rocketbooster ? repurposed from the shuttle fleet?s inventory ? capped with adummy fifth segment. The thicker second stage, Orion crew capsule and launchabort system are also all mock-ups built to simulate the size and mass of thereal thing. During nextweek?s launch test, the flight is expected to last just over two minutes andreach an altitude of about 28 miles (45 km) as the Ares I-X rocket launcheseastward over the Atlantic Ocean. First stage separation will come about twominutes, 33 seconds into the flight, with the first stage parachuting down tothe ocean to be recovered. The dummy second stage and Orion mockups will crashinto the ocean and not be recovered, mission managers have said. The AresI-X flight is the first of three planned test flights for the Ares I rocket.The next launch, dubbed Ares I-Y, is slated to launch in 2014 and include areal second stage. The thirdmission, called Orion I, is planned to launch an actual Orion spacecraft intoorbit, but on an unmanned test flight, Diller said. SPACE.comwill provide full coverage of NASA's Ares I-X test flight with Managing EditorTariq Malik and Staff Writer Clara Moskowitz. Click here for full mission coverage.